Online Indian Rummy is increasingly gaining popularity among the players these days. With a very deep root in Indian social and cultural scenario, Rummy is symbolised as an ultimate mode of entertainment and fun for the people in several occasions. The online version of this game is even more popular among many new players who always find out new ways to learn rummy game and its intricacies. In this post, we are going to present some interesting yet valuable tips so that beginners of the game and part-time Rummy players can gain vital insights about how to play the game better. 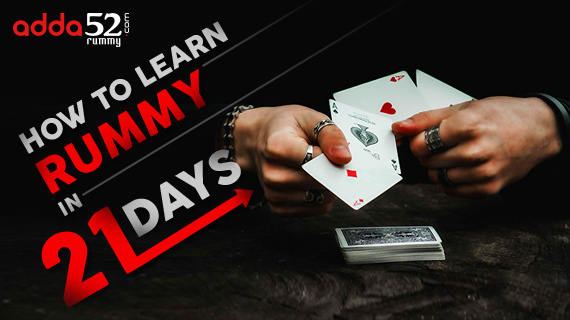 These Rummy game basics are common for all players at the beginners’ stage and following them will help you to gain some knowledge and practising them regularly for 21 days will prepare you as an advanced Rummy player. As a beginner, you must be wandering what you should at the first instance or what you should start with. The first thing that you should do in your endeavour to become an expert Rummy player is getting acquainted with the game and the methods to play it. Indian Rummy follows a similar approach in all the online Rummy portals. However, the method of playing it solely depends on the individual’s game plan. For the first 4 to five days, your Rummy learning must be spent in reading about the game. Collect good literature on Rummy from verified sources and read them all for a solid foundation of your understanding. The most important thing is this phase should be that you reading about Rummy should gradually take a shift from theory level to practical aspects and case based reading. Never stop reading, even if you become an expert. It is quite easy to understand Indian Rummy game. There are different varieties of Rummy games played in different parts of the country and interestingly, you will find their online versions available too. Hence, you must prepare yourself to play all the variants of the game. In the next couple of days, spend some time to learn the game rules. The primary aspect is understanding how to arrange sequences and sets. A sequence is 3 or 4 successive suited cards and a set is putting together 3 or 4 cards of same unit; however, different suits. One pure or original logical sequence must be made to win the game. After you have spent sufficient time studying and knowing the rules of the game, it is time to play a few tables of Rummy. Ideally in the mid of the second week, i.e. towards the tenth or eleventh day of this entire episode, you should team up with your level of players to play the game. The logic to play with other beginners or entry level players is to gain more understanding of the practical aspects of the game and give a steady start to your Rummy career. If you will take on heavy weights of the game right from the beginning, you will easily get demotivated and lose interest from the game. Also, you must avoid playing at professional level tournaments at this stage. This is one of the important tips to learn rummy fast. In many online Rummy portals, you can find players’ profile and pick up a table that has players similar to your expertise. Towards the end of the third week, that is at the end of the 21st day, you will be confident enough to play at an online Rummy table. Online India Rummy is a vast topic to master. You must utilise the first 21 days of your learning period judiciously. Remember that a solid foundation to become a successful online Rummy winner is to make your understanding of the game very clear and be aware of what is going on around in the world of Rummy.